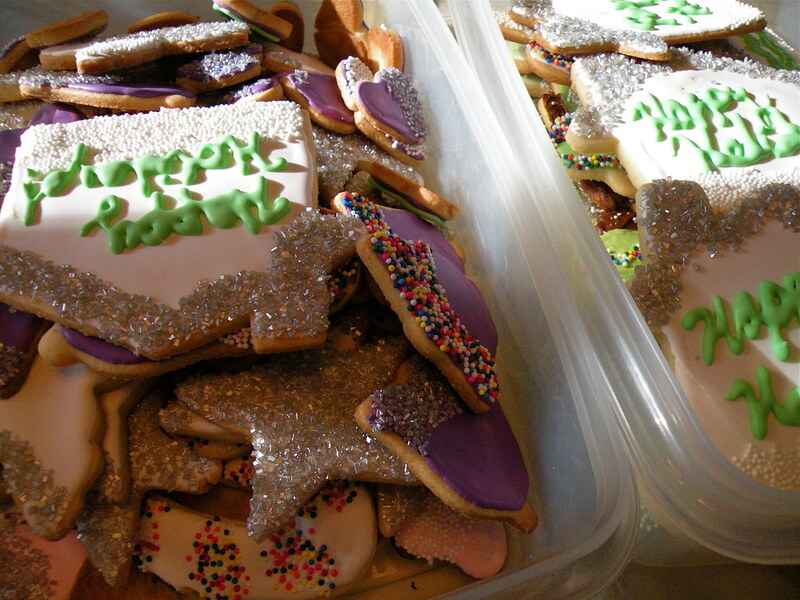 One of my annual holiday traditions is to bake up several batches of decorated sugar cookies. 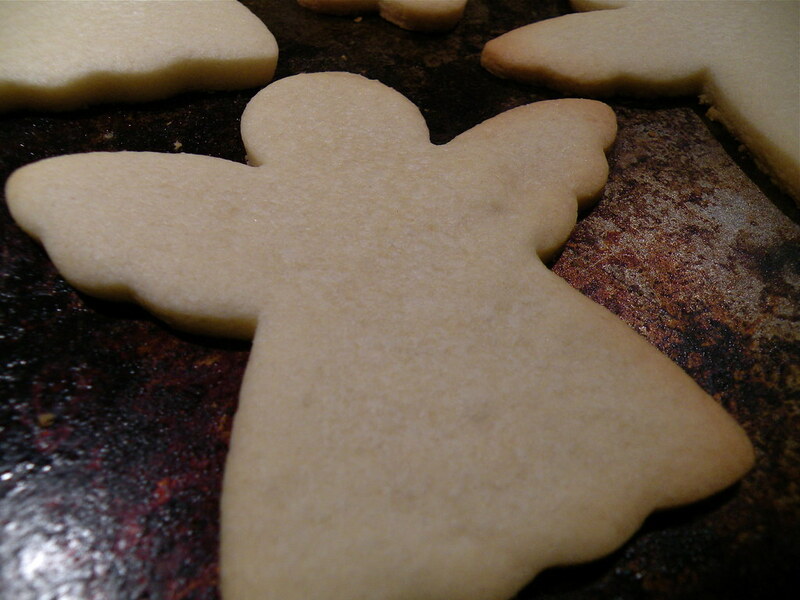 And not just any old cookie – Martha Stewart’s sugar cookies. Several years ago, I purchased a cookie baking kit from the website. It included a recipe book, sanding sugars, icing bags and perhaps also some coloring. I also purchased four large tree shaped copper cookie cutters from her site as well. 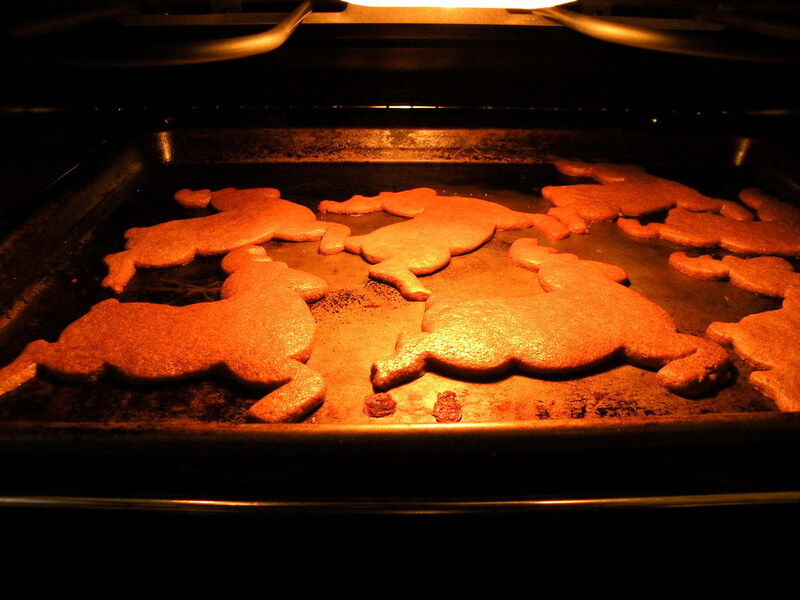 Since then, I’ve amassed quite a large collection of cookie cutters – tiny 1″ guys to 4″ wide houses and reindeer. I’ve found that the large sizes get the oohs and ahhs, but the smaller one’s actually get eaten. Since these cookies take so long to make – from dough to royal icing decorated cookie – I usually give most of them away as gifts. 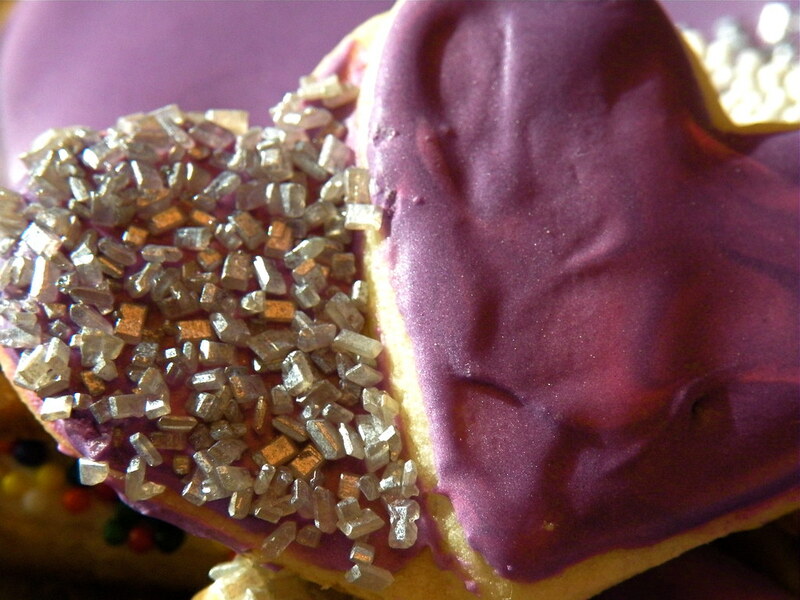 The recipe is very easy to make (as long as you have a stand mixer) and the cookies are tasty! Here’s a link to the cookie recipe. The recipe I follow, which came with the cookie kit, is double the measurements of the online recipe. And mine doesn’t call for milk or brandy. 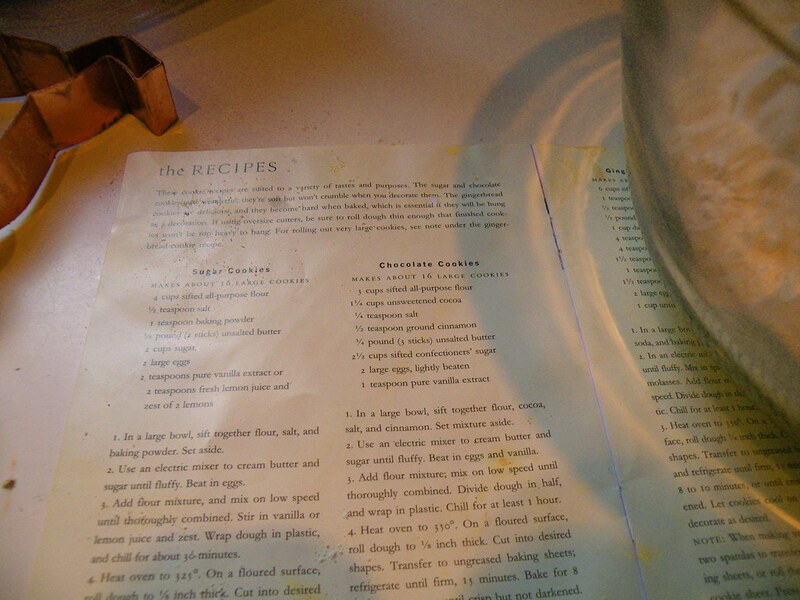 My well worn and stained recipe booklet. I tried the chocolate recipe once,but it was not as good as the sugar cookies. One of the most popular shapes I make are these little hearts, which are maybe 1-1/2″ wide. These house ornaments are about 4″ wide and I usually give them to business contacts as a ta-da moment – few people at parties ever want to tackle a cookie this big. 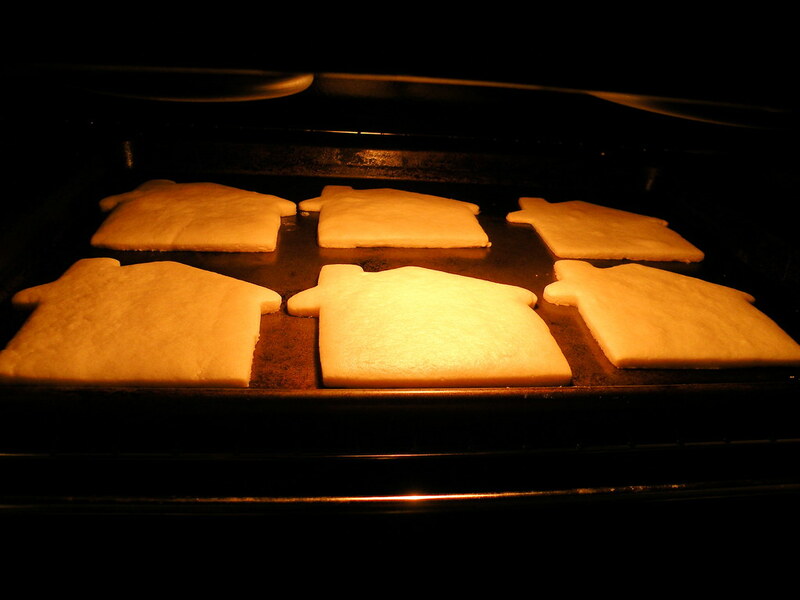 Wondering if it’s bad to shove my camera in the oven…? 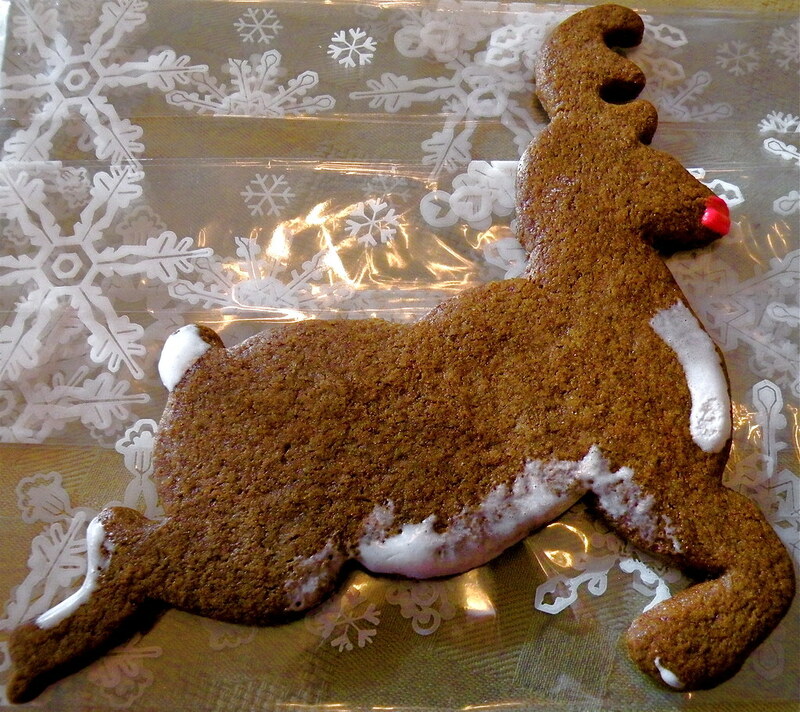 This year I added gingerbread reindeers to the mix. I’ll confess it, this was a package mix. Trader Joe’s has a gingerbread spice cake and baking mix and they have directions for cookie dough. It worked really well, rolled out nicely and is quite tasty, although very peppery. 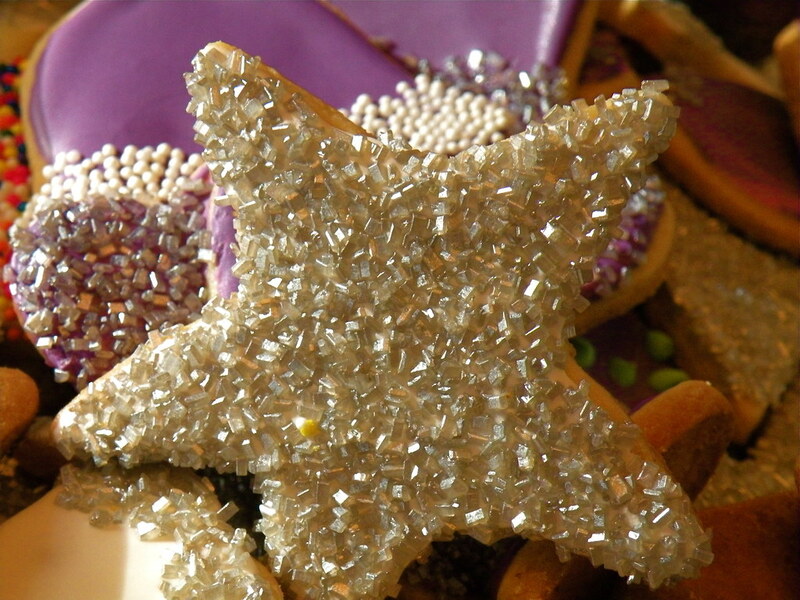 The trick to these sugar cookies is the use of royal icing. Here’s a link to Martha’s recipe. 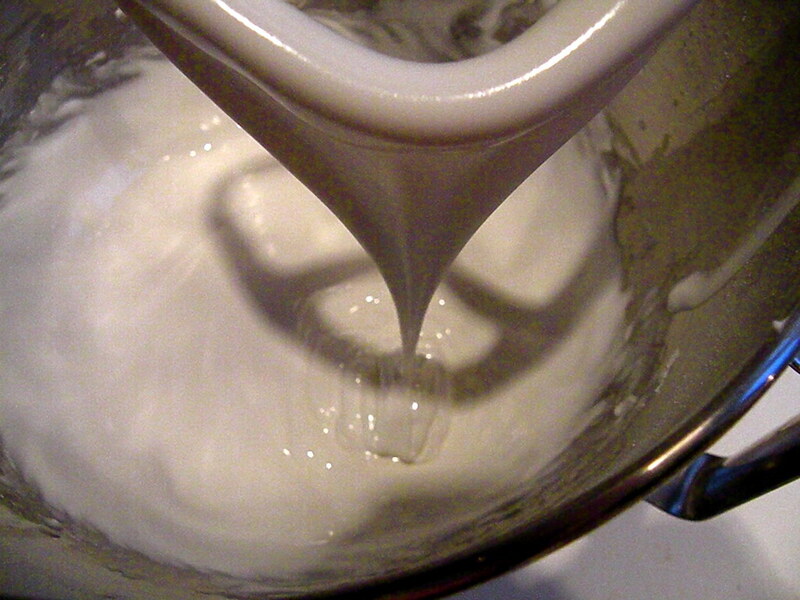 Royal icing is basically confectioners sugar and egg whites. 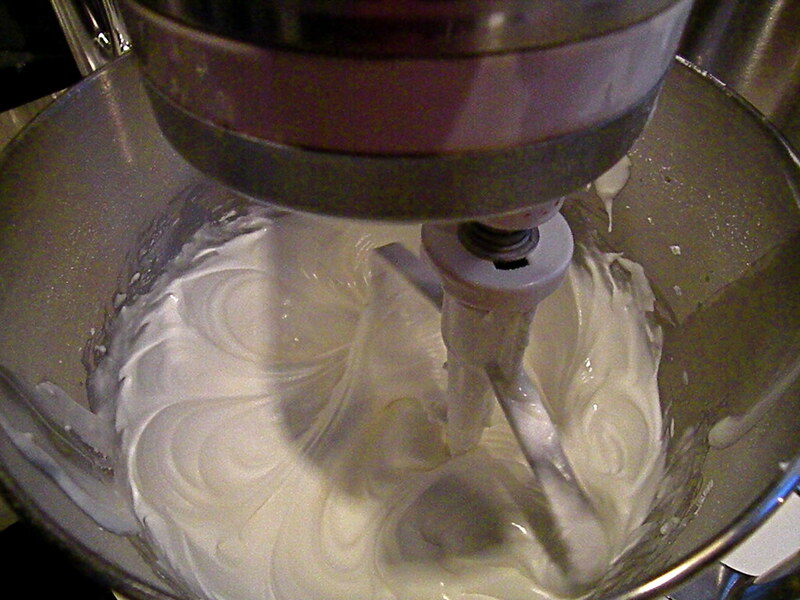 I use meringue powder instead of fresh egg whites and usually do 1 cup sugar to 1 tablespoon meringue powder. Plus add water as needed to achieve the right runny but not too runny consistency. I like it when the icing runs easily off the beater and pools, then flattens out. Ah, three double batches later.. I am no Martha Stewart when it comes to really fanciful artwork on my cookies. But I do like to come up with a variety of looks every year. My favorite new thing this season is this silvered sugar. Sparkly! I’m loving the purple! I’ve been using Wilton gel colorants to tint the icing. 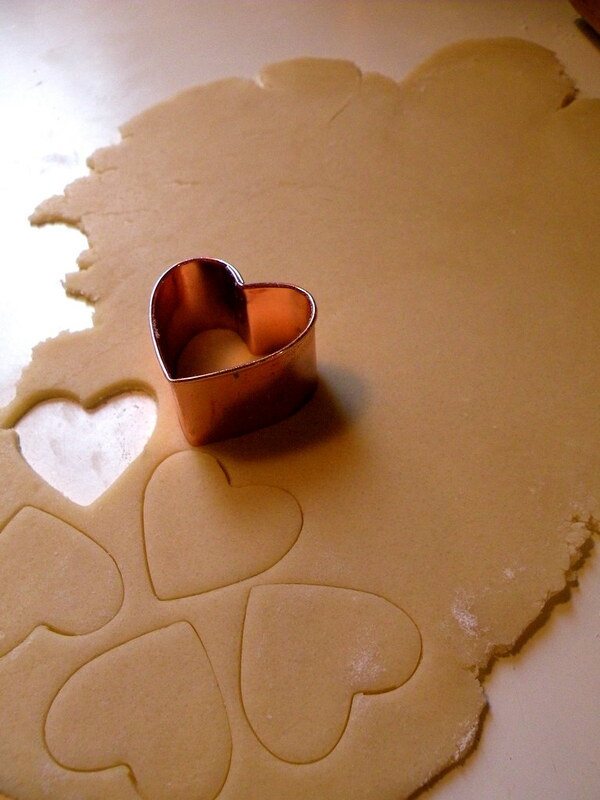 These are double hearts which I bake together. Note the slightly marbled effect that I was going for with the pink and purple icing. And my favorite silver sparkle stars. Just ignore the single yellow non-pareil that decided to play hitchhiker. 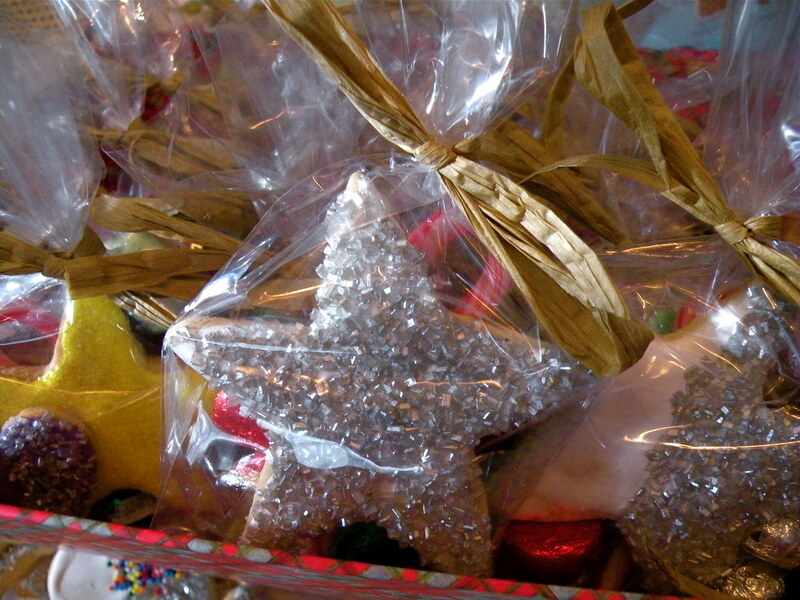 As I said, I often give big and small bags of cookies as gifts. These are the gift packages I made up for my flute students. Each gets one medium or two small cookies, some Hershey’s kisses and a small candy cane. Just a little thing. Other bags are much larger and hold 8-10 cookies. what a marvel you are!! Thanks for all the info and sharing..
You did such a beautiful job. I love that frosting recipe, have used it many times myself. I like the way it dries on the cookie! Great gifts for your students and friends. What delicious cookies! And that silvered sugar is gorgeous. 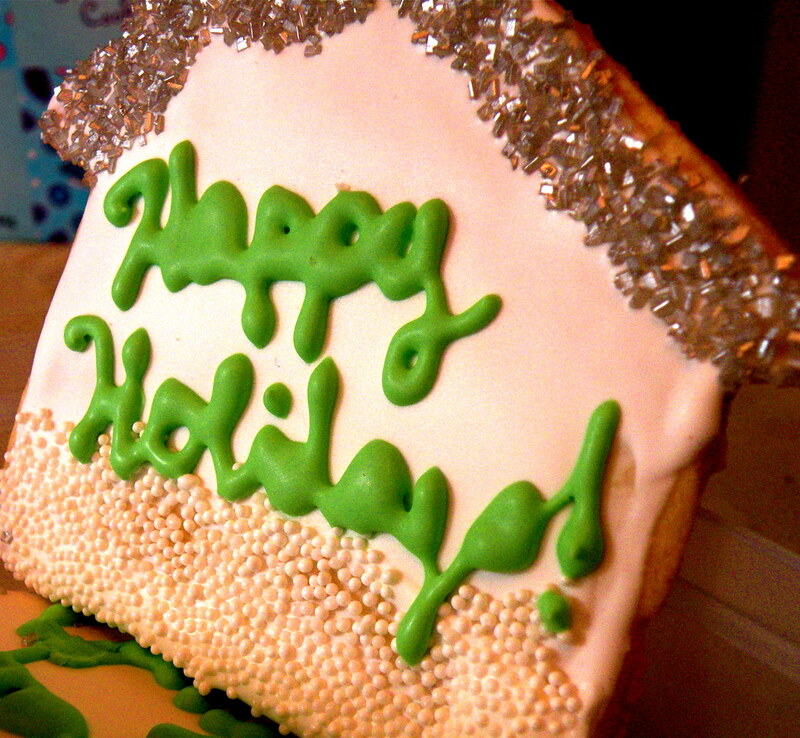 I always mess up with big cookies, so I'd definitely be oohing and ahhing along with everyone else over them :-). You totally sold me when you mentioned Trader joes ginger cake mix. 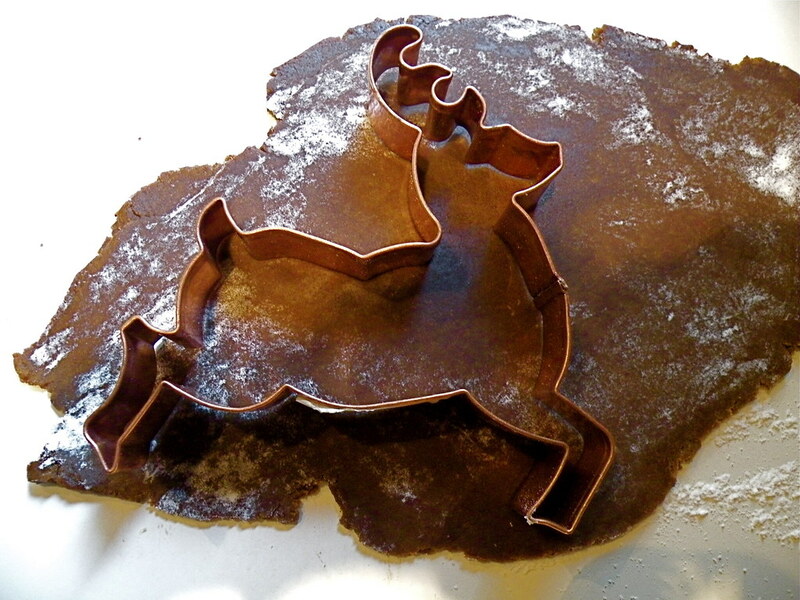 I have the same reindeer cookie cutters and it's about time to put them to use! 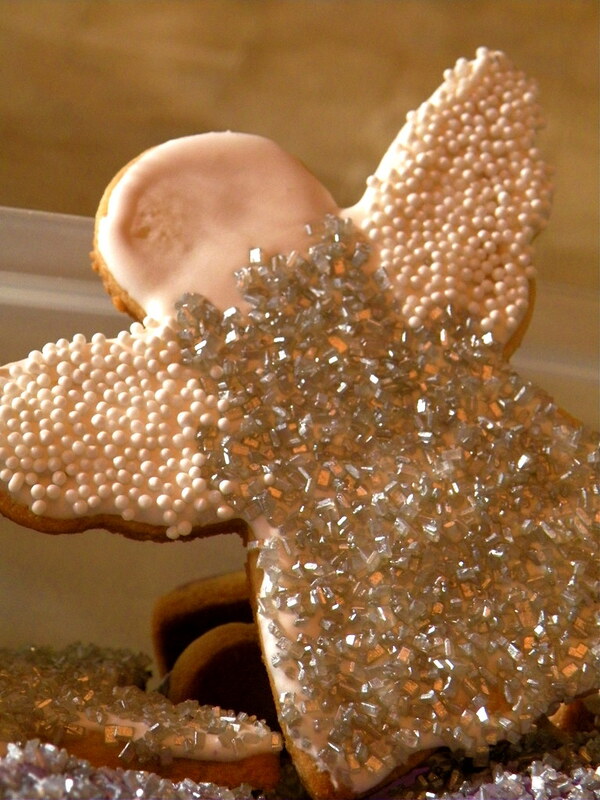 Love the Angels with the sparkly sugar. Where can I get that? 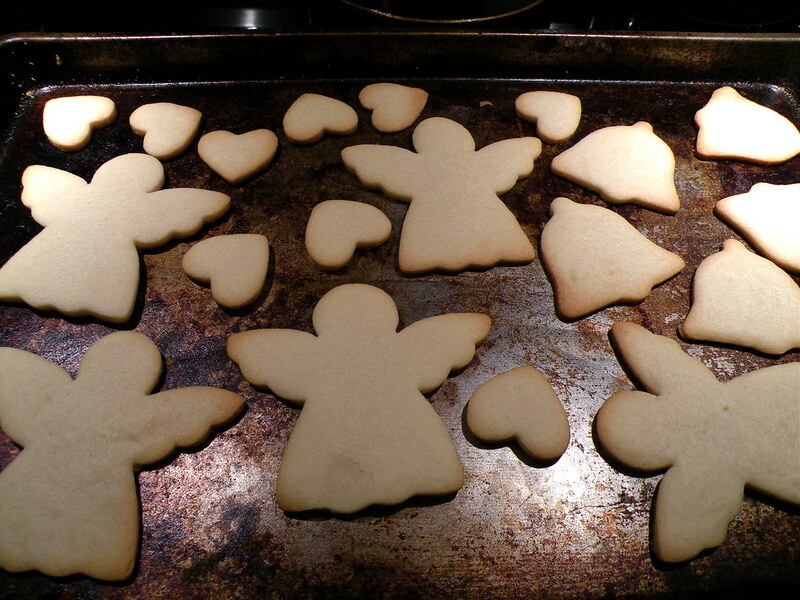 I adore the angels, too beautiful to eat!! Your cookies are beautiful. Thank you for the recipes. I think we will try these tomorrow. My little girl and I have been trying to bake cookies for days and somehow it just keeps getting pushed to the bottom of the list. Tomorrow is the day thanks to your inspiring post. Such beautiful cookies, Linda! 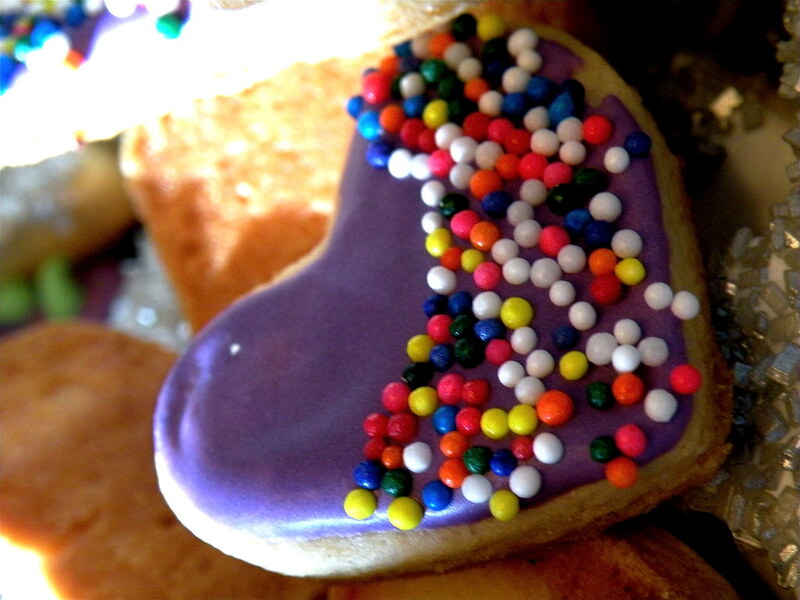 Christmas has sneaked up on me this year so I doubt I will have time for cookie-baking. Yours look even prettier than the ones I've seen in Martha's magazine. Have a Merry Christmas! Thanks everyone! Oh, and I'd forgotten to say that the silvered sugar comes from Wilton, and I got it at Michael's arts & crafts in their bakery (cakes, cookies and candy!) aisle. They have all the colorants and sugars, etc. Although, nothing has beaten the original sanding sugars that came with Martha's kit. It all looks so great Linda,I love the shapes & glitz ……. 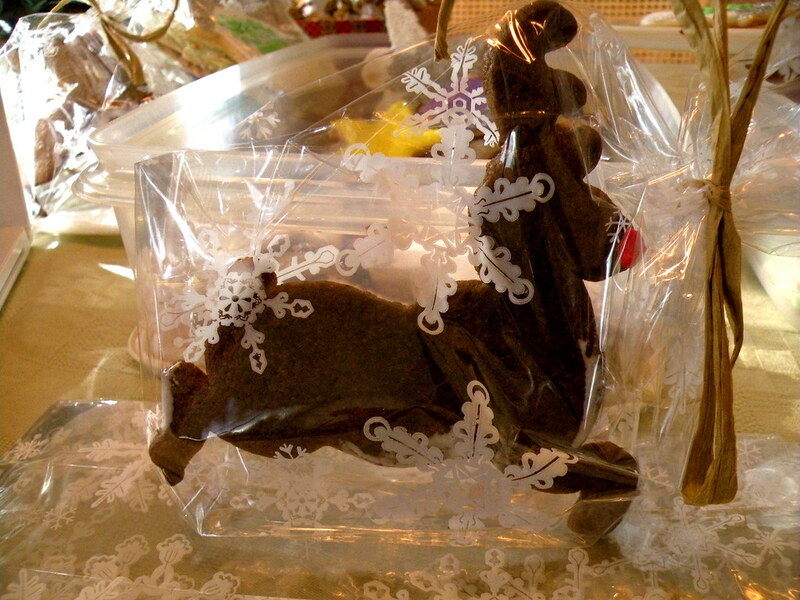 I am experimenting with some 4 legged treats this week for those doggies in our lives! These are obviously for people that have nothing to do but bake cookies and decorate them. They are gorgeous!!!! try doing it wih a family of 5! Yikes!!! Wow, I am impressed big time, I have not had time to make anything this year…not a thing. omg!!!! do you have any left? those are so gorgeous!!!!!!!!!!!!!!!!!! !1 I am tempted to make some today!!!!!!! Very unique and pretty cookies. Merry Christmas early!